The Gulfstream G280 that set a city pair record between Savannah, Georgia, and Van Nuys, California, on sustainable alternative jet fuel by flying 2,243 nautical miles at Mach 0.85. Picture Source: Gulfstream. Sustainability is a hot topic. From revolutions in the way we recycle to a clamp down on the use of single-use plastics, you can see it everywhere you go. It’s also a major talking point in aviation. You may recall our article discussing the industry’s intentions to tackle pollution in major ways. And, thanks to the G280, it looks like some of these goals are already coming to fruition. 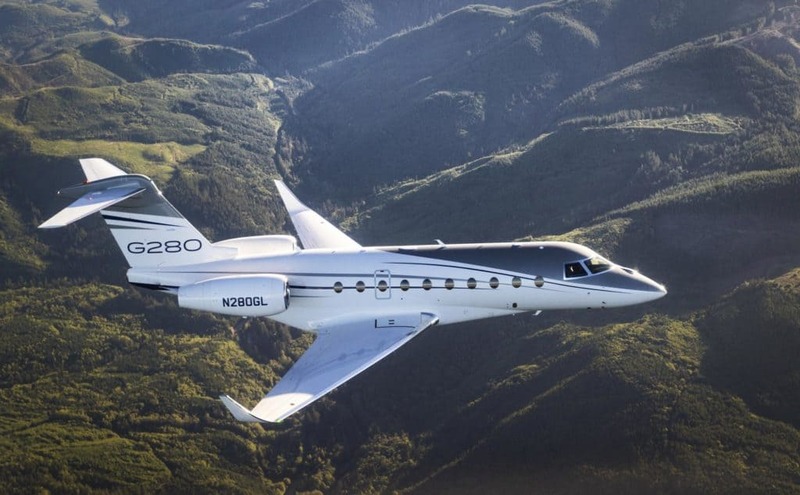 In January 2019 the Gulfstream G280 set a city-pair record, which is impressive in itself. It’s also a familiar sensation for supporters of the G280, as it is in fact the 64th city-pair record to be set by this marvellous machine. You only have to take a glance at its specifications to see why the G280 so effortlessly smashes records everywhere it goes. With a max range of 3,600 nautical miles and operating at Mach 0.85, the aircraft is capable of transporting ten passengers and sleeping five. Despite this, it can reach 45,000 ft of altitude. Among its records is the fastest non-stop flight between London and New York – a flight where fast speeds can be very important to flyers. But what’s really got people excited is the fact it did it using sustainable alternative jet fuel (SAJF). This was no gimmick, either. The flight was a lengthy one: Savannah, Georgia to Van Nuys, California. The flight time of 4 hours 49 minutes was enough to take the top spot with an average speed of Mach 0.85, its max capacity. It becomes even more impressive when you take into account the fact that the pilot faced average headwinds of no less than 76 knots. The flight time of 4 hours 49 minutes was enough to take the top spot with an average speed of Mach 0.85, its max capacity. Picture Source: Gulfstream. So, what exactly is SAJF, and why is it so important? Well, society as a whole is generally making a combined effort to reduce pollution and make our resources stretch as long as possible, doing the least damage to our planet in the process. You can see examples of this everywhere: one similar parallel can be seen in cars, with many now operating on electricity instead of burnable fossil fuels. SAJF has a similar purpose. According to a journal published by the National Academic Press, its aim is to lower the net life-cycle carbon emissions of commercial aviation. This is achieved via a number of drop-in replacements that take the place of part of the fuel. This can be quite a large proportion in some cases, so the reduction on fuel consumption are very significant – often well over half of the fuel itself. ‘A wide array of organizations has been working for the last decade to support the development of SAJF and to create a framework by which such fuels can enter the marketplace. SAJF could sound a little unsafe to the sceptics out there. It is, on paper, always fairly dangerous to combine a combustible fuel with an experimental substance. But here, there’s nothing to worry about. The Federal Aviation Administration has already made it clear that SAJF is indeed safe to use, likening it to Jet-A. In the coming years, experts have predicted that we will see an increase in the calls for SAJF and other alternatives which could lead to fairly drastic changes in what is considered normal in the industry. The key is doing that whilst making minimal negative changes to the experience of flyers. Unsurprisingly, this appears to be something Gulfstream have been considering for many years now. Those of you familiar with Gulfstream will recognise that this is not their first venture into the area of sustainability. The Gulfstream G450 picked up the accolade of becoming the first business that managed to go from one side of the Atlantic – all using SAJF. That was way back in mid-2011. ‘Since then, we’ve taken ever-greater steps in supporting sustainability, including securing a dedicated supply of SAJF for our corporate, demonstration and flight-test fleet,’ says Gulfstream President Mark Burns. ‘Our company aircraft have already flown approximately 700,000 nautical miles on SAJF, saving more than 750 metric tons of carbon dioxide. If the numbers are to be believed, the Gulfstream leader is not wrong. The company has racked up 700,000 nautical miles using SAJF and its combinations of fuels. In total, that equates to 750 metric tons of carbon dioxide being saved. Gulfstream have a history in this department, and by the looks of things they have a long future in it too. There are already plans to incorporate SAJF right to customer-facing aircraft as early as this year. Those flying from Long Beach Airport in California will be part of the eco-friendly future of Gulfstream. Savannah customers will already be familiar with the concept; the company has been using a 70%/30% mix of SAFJ and jet-A for nearly three years already. Whether you’re an eco-friendly enthusiast championing every green step the airlines take, or you’re of the view that the panic has been somewhat blown out of proportion, is largely irrelevant here. All parties, regardless of their views, will note that Gulfstream have achieved something special here. Not only have they helped to demonstrate that SAJF is a safe and viable option, but they’re used it to elevate the G280 to record-setting status. This may just be one small record for the G280, but it could be a giant leap for a sustainable future.